AC.A.A.N. The magician's dream effect! 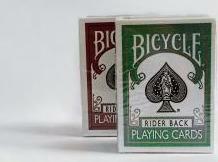 A pack of cards is fanned and a spectator is asked to name any card he sees. A second spectator is asked to name any number between 1 and 52. The fan is closed and the cards are handed to a third spectator who deals down and reveals the named card at the named number!!!. This is Marc Paul's version of this reputation making effect. This product was added to our catalog on Saturday 28 November, 2016.